H.M.S. Orpheus strikes the Manukau Bar, 7 February, 1863. 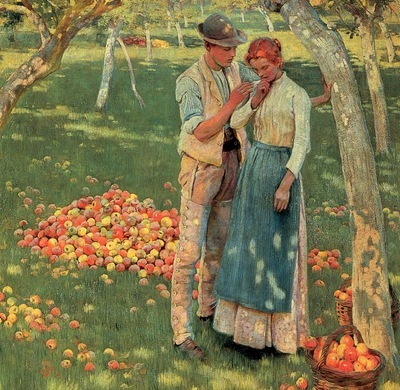 Friend of Rose Cleveland and Evangeline Marrs Whipple, Erichsen's "The Orchard" brings to mind images of the fallen woman, with a reversal of the Tree of Knowledge and Eve's giving the apple to Adam. Here the male seems to almost whistfully comfort the female, who one surmises have fallen from innocence into experience, but the glorious colors are nature's obvious indifferent joy to the couple's soul-wrenching realizations. The hand against the tree is ambiguously supportive and seductive; with no image of a snake, the knowledge is comforting and hopeful for a future, though the female's obvious regret lends to feminist themes, probably understood by Cleveland, Whipple and Erichsen. Quiet, overlooked masterpiece drawing on Millet's realism and the Fauvist colors. . . piled apples are still lives representing the number of falls . . .contact rpowers900@yahoo.com for more information.